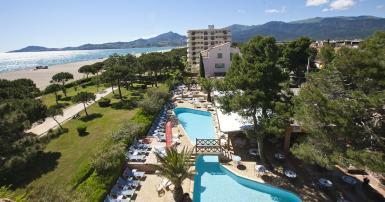 Our Mediterranean-style hotel Le Lido in Argelès-sur-Mer has direct access to the sea and its own private beach. Situated in a residential neighbourhood and surrounded by a large, shady and flower-filled garden, it offers its guests a haven of peace in a friendly atmosphere. Our heated swimming pool offers an alternative to the sea, ensuring you will never tire of taking a dip! Our 66 spacious and comfortable rooms and junior suites with their own terrace offer magnificent views over the Mediterranean, the hotel garden or the Albera mountain range. Some rooms are suitable for families of up to four people. The kitchen of our panoramic restaurant overlooking the sea is run by chef Romain Thiebaud, a member of the association of professional chefs "Toques Blanches du Roussillon". His delicious, southern-inspired meals are served on the terrace or by the poolside. For older children and adults, an extra bed costs 30 euros per person per night (no food included). Children's menus are available in our restaurant, depending on your child's appetite. The number of extra beds or cots is limited to one per room. If you need more than this, we also have Junior suites. Please request more information on +33 (0)468 811032. Since many years we love to spend a few days during spring or autumn at Le Lido, specially when we can stay in room 19 on the ground floor with easy access to the beach and walking area for our dog. The english speaking hotel staff are very friendly, helpful and understanding. The "around the pool" excellent breakfast is a good start of the day, though at times we feel a little pushed to finish breakfast. Unfortunately, parking space is a little cramped. We always recommend Le Lido to our friends in case they are looking for a hotel in this beautiful area of France. Everything allright (location, room, staff etc.) Exept your kitchen needs improvement. We stayed several times in your hotel and every time we were disappointed by the meals. Avis laissé le 02 2018 par The H.
Hotel du Lido is a very special hotel! My husband and I have stayed here for many years since 1998 and we come back year after year because we appreciate the location, the family atmosphere, the good food and the friendliness of the staff. Thank you everyone at the du Lido! Avis laissé le 01 2018 par Chris C.
We love this hotel, It was probably our sixth visit! I can understand why some might not like it. It's not a plush city center hotel. It is a family hotel situated on a beautiful beach. There kids and pets and many of us return year after year. We are comfortable and feel at home. Etienne & Pascal who run the hotel share with the staff all the tasks in the hotel with great enthusiasm. Much has been upgraded, Nothing is too much trouble. Cuisine excellent. Wine a bit pricey . Some rails in the shower, toilets and pool would help the unsteady. Looking forward to next year!. Avis laissé le 25 2018 par Anthony A.
Fab hotel great staff, very clean comfortable rooms .